October has been & gone and now it’s november (already?!) so it’s time for a recap… For now, let’s focus on the oh-so-fabulous flowers that we’ve seen so far. 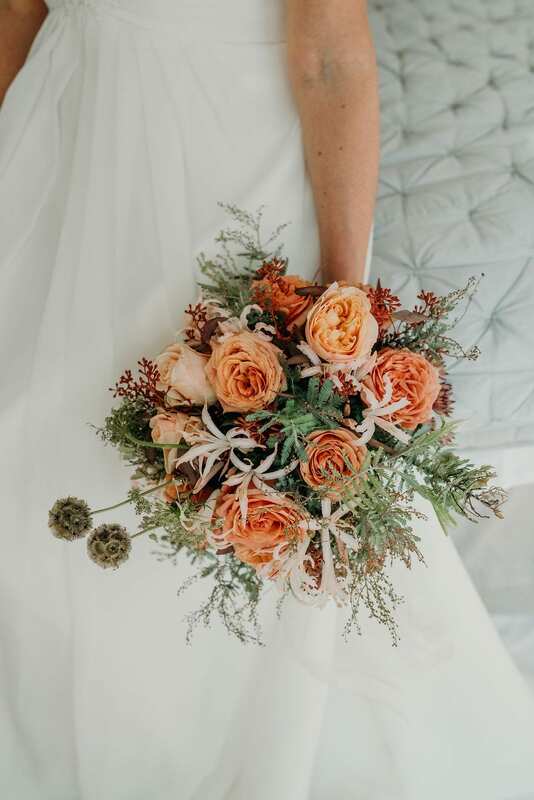 Loved the foliage in Leanne’s bouquet! Michelle & Jonny’s stylish elopement (read more here) took on deeper shades, focussing on reds contrasted with greens and rich ivories. Deborah from dartmoor flowers, and one of Amanda Randell’s students, Sarah Young, stood in during half term and created some beautiful bouquets. Simply stunning! The first two images were Deborah’s creations, and the second two were Sarah’s. All of our elopement couples are welcome to request additional flowers from amanda, which a few have done so far. Flower crowns, aisle petals, and even dress accessories! And we musn’t forget the styling extras! Michelle & Jonny’s incredible centrepiece, and foliage as an extra ‘something’ on the napkins at Sarah & Dan’s wedding. All in all we’ve had some wonderful floral creations… and that’s not it for our october weddings either! We’ve had a couple more towards the end of the month, and their photos will be ready super soon so keep your eyes peeled!